Christian Media in Nigeria : Don't Miss Behavioural Change Practitioners Conference 2015! Don't Miss Behavioural Change Practitioners Conference 2015! 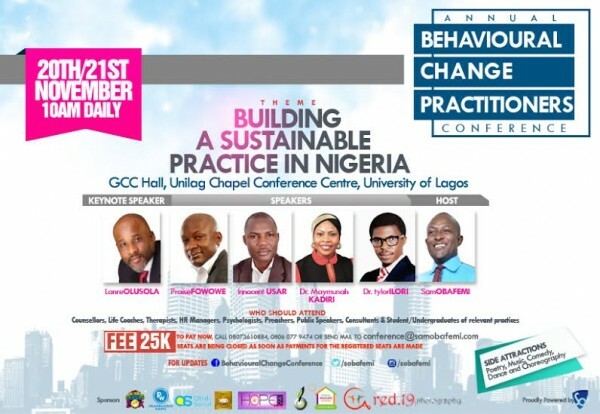 The Behavioural Change Practitioners Conference which is scheduled to hold on the 20th and 21st of November , 2015 at the GCC Hall, Unilag Chapel Conference Centre, University Of Lagos, is almost here, and the anticipation is building. Among the speakers include Lanre Olusola, Praise Fowowe, Innocent Usar, Dr Maymunah Kadiri, Dr Tylor Ilori and the host Sam Obafemi. Registration is in progress and the programme is strongly recommended for life coaches, counsellors, consultants, public speakers, psychologists and those of relevant practices to take advantage of this unique opportunity. Thank you. God bless you for supporting our work.